FILE - Japanese whaling ship Yushin Maru No. 2 sails in the Southern Ocean off Antarctica. Australia and New Zealand have condemned Japan’s move to send a whaling fleet to the Southern Ocean. It comes a year after an international court ruled that Tokyo’s whale hunt in the Southern Ocean should stop. Last year, the U.N.’s International Court of Justice (ICJ) found that Japan's whaling program in the Southern Ocean was unlawful because it was not for purposes of scientific research. The Japanese government says its new whaling mission takes into account that ICJ decision and is now a much smaller operation. The nation’s Fisheries Agency says the fleet intends to capture 333 minke whales, about one-third of what it used to harvest. Whalers will also carry out non-lethal research, including sighting surveys and the collection of biopsy samples during the three-month-long hunt. The fleet set sail Tuesday for the Antarctic. Professor Alex Gillespie, an expert in international law and conservation at the University of Waikato says Japan insists its actions are legitimate, despite last year’s court ruling. “The ICJ made a decision that the particular whaling program was not doing scientific research and it had to stop. The ICJ did not say that scientific whaling had to stop, and so what Japan has done is come back and try to create a new program but the problem is is all the scientists who are looking at it are still saying there is no scientific need to do lethal scientific research in Antarctica,” he said. Lawmakers and government officials try whale meat dishes to promote whale meat at a dining room of Ministry of International Trade and Industry in Tokyo Wednesday, Nov. 19, 2014. Both Australia and New Zealand have condemned the whale hunt. Australia’s Attorney-General George Brandis told parliament that diplomatic representations were being made at “the highest levels” in an effort to make Japan change its mind. Canberra and Wellington have long insisted that Japan’s whaling operations were commercial whaling in disguise. Tokyo insists there are sound scientific reasons for the hunt and that its practices are sustainable. It has dismissed the concerns of critics as irrelevant and sentimental. 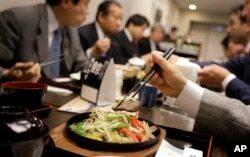 Whale meat often ends up on supermarket shelves, although most Japanese no longer eat it.